Enthusiastic driver Ron Duncombe brings his high energy performances to Advance Auto Parts Monster Jam after many years of competing in other motorsports disciplines. Duncombe’s motorsports career started in BMX competitions followed by racing motorcross from 1984 until 2002. Next, Duncombe moved to racing at asphalt oval tracks, competing in train cars and in late model lites. Along with his monster truck racing schedule Duncombe also races a USAC focus midget. In 2011 Duncombe again expanded his motorsports resume when he started racing in the Lucas Oil Off-road Series in the Superlite division. 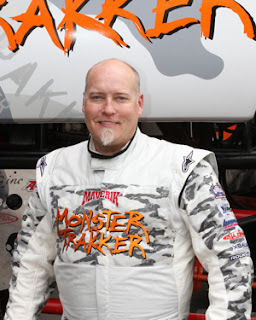 Q&A with Ron Duncombe: MonsterJam.com: How did you get started competing on the Monster Jam circuit? Ron Duncombe: It was always a dream of mine to drive a monster truck. I worked with Maverik (sponsor) and was able to secure a truck and start competing. So all you fans out there don’t ever stop dreaming. I’m living proof dreams come true! MonsterJam.com: What do you enjoy doing while on the road with Monster Jam? Ron Duncombe: Spending time with the other drivers and my crew. But most of all I love meeting all the Monster Jam fans. MonsterJam.com: What do you do with your free time? Ron Duncombe: I enjoy hanging out with my family, racing and also hunting and fishing in our off season. MonsterJam.com: What is your greatest memory as a monster truck driver? Ron Duncombe: In my hometown, getting the racing win over Bounty Hunter at the Energy Solutions Arena in Salt Lake City, Utah. MonsterJam.com: Do you have any pre-show rituals that you run though? Ron Duncombe: I’m not one to be real superstitious so I don’t put my left shoe or glove on first. I just try and relax a bit and visit with fans at the pit party. It’s like the calm before the storm! MonsterJam.com: If you were not competing on the Monster Jam tour, what career path would you follow? Ron Duncombe: I have hosted a reality adventure show (maverik-kickstart.com ) on TV, so probably something with TV or radio. MonsterJam.com: What’s your favorite food? Ron Duncombe: Sushi. MonsterJam.com: What’s your favorite movie? Ron Duncombe: Days of Thunder. MonsterJam.com: What’s your favorite television show? Ron Duncombe: Monster Jam on SPEED. MonsterJam.com: What’s your favorite color? Ron Duncombe: Red.